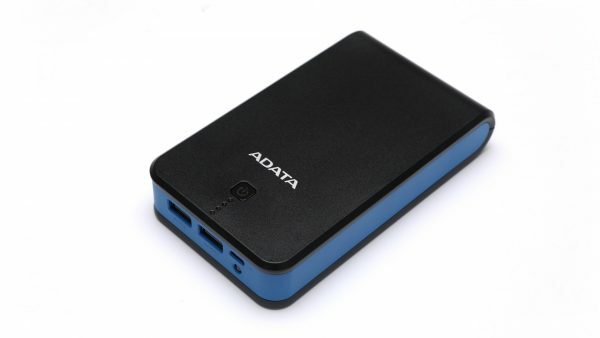 The 16750 mAh ADATA P16750 Power Bank is another high-capacity mobile power bank from ADATA similar to the 20000 mAh P20000D model that we have recently tested, but not quite the same. The ADATA P16750 comes in a pretty compact size for its capacity, uses a nice-looking plastic case and comes with a power button and LED light indicator for the charge level. It has dual USB charging ports and can charge two devices simultaneously, but with a maximum total output of 2.1A for both ports. The input for charging the power bank is 5V/2.0A, so that the large battery capacity would not mean a day needed for a full charge at just 1.0A charge current, though you need to make sure you use a suitable power adapter. Just like its bigger brother the P20000D there is also a LED “flashlight” feature that we find useless, but other than that it seems like a really good power bank taking into account the specializations and features. Let us take a look at the performance of the 16750 mAh ADATA P16750 Power Bank in our discharge tests trying to figure out what the usable capacity is. We see good and stable voltage curve during both 1.0A and 2.1A constant current loads with just a slight hitch at the end of the 2.1A discharge where we see a more significant drop for a bit before hitting the completely discharged state of the battery. In overall a good performance regarding the available capacity at both discharge currents we have tested, though it would’ve been better if the maximum combined output for the two charging USB ports was more than 2.1A for this high capacity power bank.